The Indianapolis Museum of Art continues its celebration of Indiana’s Bicentennial with A Joy Forever: Marie Webster Quilts, now open in the Museum's Gerald and Dorit Paul Galleries. The exhibition features 25 appliqued quilts by Marie Webster, an Indiana native who rose to national fame in the early 20th century. Webster was discovered in 1911 when Ladies’ Home Journal, one of the most widely circulated magazines in the country during the period, included four of her quilts in full color for the first time. The exposure propelled the relatively unknown, amateur quilt maker from Marion, Ind. into the national spotlight. Also on display in the exhibition are some of Webster’s patterns, original pages from Ladies’ Home Journal and a digital version of Webster’s scrapbook, which invites guests to browse through Webster’s fan letters, news clippings and other memorabilia. Webster had a major impact on the quilt revival of the early 1900s. Her home in Marion, Ind. is now a National Historic Landmark and home of The Quilters Hall of Fame. Her landmark book, Quilts: Their Story and How to Make Them, continues to serve as popular reference in the field. Webster was heavily influenced by the Arts and Crafts movement and her quilts reflect her devotion to simplicity of pattern, quality of craftsmanship, attention to detail and the integration of art into everyday life. 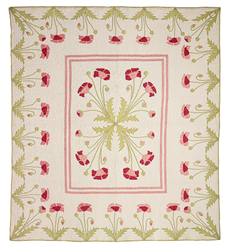 Iris (1910), one of the first quilts to appear in Ladies’ Home Journal. The innovative arrangement of iris flowers in this quilt is evidence of Webster’s knowledge and mastery of design. Poppy (1909) displays beautifully appliqued poppy flowers that provide viewers with a sense of Webster’s precision and attention to detail. Sunflower (1917) showcases very realistic, bold sunflowers in vivid colors, demonstrating Webster’s intricate stitchery. In addition to displaying Webster’s quilts, the IMA will showcase contemporary quilts in a special, juried exhibition with Studio Art Quilt Associates (SAQA) titled Dialogues: Contemporary Responses to Marie Webster Quilts. SAQA artists were invited to submit contemporary works for the exhibition that responded to Marie Webster’s quilts. Winning quilts will be displayed in the IMA’s Bret Waller Gallery from June 24 to Sept. 4, 2016. A Joy Forever runs through Jan. 8, 2017. The Museum will continue to offer Bicentennial-themed exhibitions and programs throughout 2016. Upcoming experiences include 19 Stars of Indiana Art: A Bicentennial Celebration and IMA Mini Golf, an artist-designed course featuring Hoosier-inspired holes. Both installations open in May. The Indianapolis Museum of Art (IMA) is located on a 152-acre campus of lush gardens, historic homes, outdoor sculptures, inspiring performance and gallery spaces. Founded in 1883, the IMA is among the 10 oldest and 10 largest encyclopedic art museums in the United States and features significant collections of African, American, Asian, European, contemporary art and design arts that span 5,000 years of history. With innovative programming to engage guests of all ages, the IMA offers a variety of interactive experiences inside the galleries, throughout the campus and within the local community. From gardening demos in the Madeline F. Elder Greenhouse to outdoor film screenings in the IMA Amphitheater to community celebrations in The Virginia B. Fairbanks Art & Nature Park: 100 Acres, guests are invited to interact with art and nature in exciting new ways at the IMA. Along with the Indianapolis campus, the IMA also owns the Miller House and Garden in Columbus, Ind., one of the nation’s most highly regarded examples of mid-century Modernist residences. For more information visit http://www.imamuseum.org.